We use this information to help us make our website more useful to visitors, to learn about the number of visitors to our website and the types of technology our visitors use. We do not track or record information about individuals and their visits without their consent. This means that, unless you voluntarily and knowingly provide us with personal information, Mourjan Marinas will not know your identity, your e-mail address, or any other information personally identifiable to you. When Mourjan Marinas needs to collect personally identifiable information from you to provide you with a particular product, service or information, we may ask you to voluntarily supply us with the information we need. For example, if you would like to make a reservation at one of our marinas, we will ask for information such as the vessel owner's, captain's and charter agent's names, addresses, telephone numbers and e-mail addresses, vessel size and other information about the vessel. The personally identifiable information you provide to us for making a reservation is made available to the applicable marina for the purpose of determining whether it can accommodate your reservation request. Mourjan Marinas and/or its affiliates, parent or related entities (collectively referred to in this Privacy Statement as "Mourjan Marinas IGY Companies") may use such information to contact you for confirmation and, if applicable, for processing the reservation. In addition, all such information may, unless you advise us otherwise, be used by Mourjan Marinas Companies for marketing of our products and services. 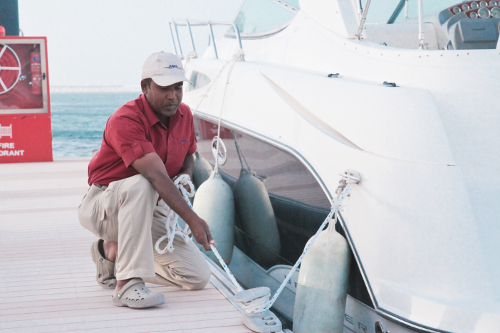 From time to time Mourjan Marinas Companies may use the services of third-party providers for the purpose of distributing such information and/or materials to you. From time to time we may also ask you to fill out an online customer survey to obtain your suggestions or comments about your use of this website, Mourjan Marinas Companies' services or for other purposes. It is your choice whether to complete such a survey or to provide us with any such information. This website is not intended for children and we do not knowingly solicit or collect personally identifiable information from children. Mourjan Marinas Companies treat the personal information you provide to us as confidential information. We use the same methods and procedures to protect such confidential information as we do to protect our own confidential information. If you submit personal information to the Mourjan Marinas Companies through this website or by e-mail, such information is stored on a secure server that resides behind firewalls designed to block unauthorized access from third parties. Because laws applicable to personal information vary by country, our affiliates may have additional measures that vary depending on the applicable legal requirements. Information collected on this website is covered by this Privacy Statement. As mentioned previously, from time to time the Mourjan Marinas Companies may use the services of third parties, such as marketing firms and fulfillment houses, which provide services on behalf of Mourjan Marinas. In such event, such parties are contractually prohibited from using personally identifiable information for any purpose other than for the specific purpose for which they were engaged by us. We prohibit the sale or transfer of personally identifiable information to any person or entity other than the Mourjan Marinas Companies and our third party service providers, without your approval. This is a United Arab Emirates website and is subject to laws of the United Arab Emirates. Mourjan Marinas Companies will disclose personally identifiable information without your permission when required by law, or as otherwise provided in this Privacy Statement or the Terms governing this website. As mentioned previously, laws related to personally identifiable information vary by jurisdiction. From time to time this Privacy Statement may be changed by Mourjan Marinas, without notice. However, any such changes will be promptly reflected on this website, so that you will always know what information we collect, how we might use such information and whether we will disclose such information to any person or entity other than the Mourjan Marinas Companies. We kindly ask you to regularly review this Privacy Statement. Your continued use of any portion of this website after any changes to this Privacy Statement shall constitute your acceptance of this Privacy Statement, as amended from time to time. This Privacy Statement were last updated on 21 July 2013.